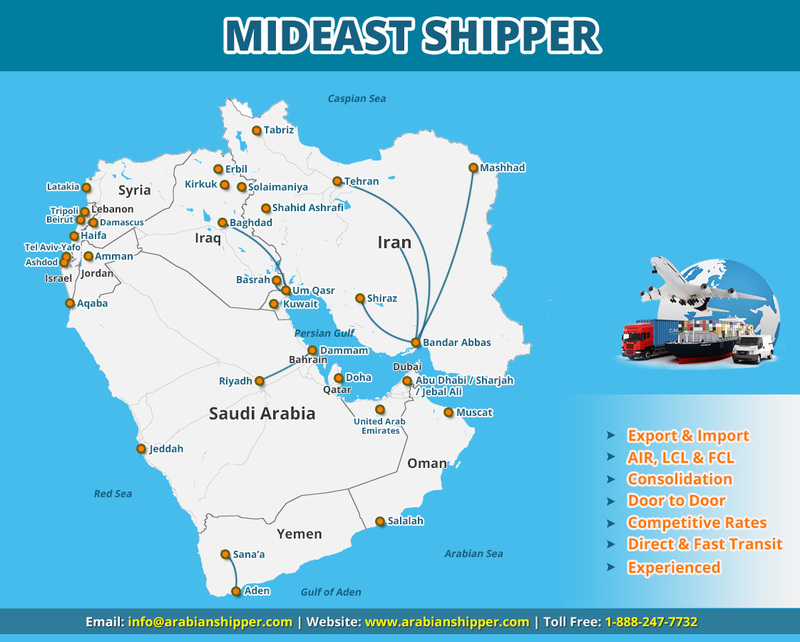 Middle East is one of the largest ports in shipping line. We Air7Seas offer shipping services to all Middle East countries. We can ship 20ft container, 40ft container, LCL Cargo, FCL Cargo to Middle East from anywhere in the US. Air7Seas has 30 years of experience in shipping industry for all shipments; it meets customer’s needs whether it they are one time customer or regular customer. We provide the option of picking up customer’s shipment from and delivering it to a port or door. Customer’s shipment will be picked up from preferred address. We transport all kinds of goods it does not matter whether the shipment is commercial goods, household goods or industrial materials. Middle East has huge demand for vehicle shipping, so that we Air7Seas are one of the best freight forwarder to the Middle East in shipping industry. Every year thousands of vehicles are shipped to Middle East from various ports of United States. While shipping vehicles to Middle East customer should be aware of existing regulations. While shipping vehicles to Middle East customer should have vehicle’s registration and title also the owner should have valid driver's license. We are providing reliable household goods transportation service to Middle East for our customers. We provide both Air and Sea freight services for our customers as per their needs. Providing safe and secure transportation service for our customer is the first priority for us. We have services like door to door, door to port and vice versa. We also provide Insurance for our customer’s shipment in case of any loss or damage during the move. We have low shipping costs compared to others. The Following items are restricted in Middle East countries while transporting goods.